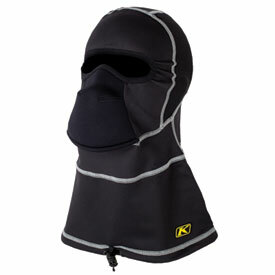 Klim's most technical head sock for the aggressive rider who encounters the harshest conditions. Featuring an over-the-collar design, the Glacier Balaclava is the perfect blend of extreme weather protection and active riding functionality. Specifically designed for the aggressive riders in the coldest conditions/harshest elements. Neoprene breath box deflects moisture down and away from goggles. Wide-skirt over-the-collar design with cinch cord keeps rain/snow out. Lighter materials for a more active rider. Lycra stretch panel for perfect fit on any head shape/size. Elastic side panels offer contour fit on neck.